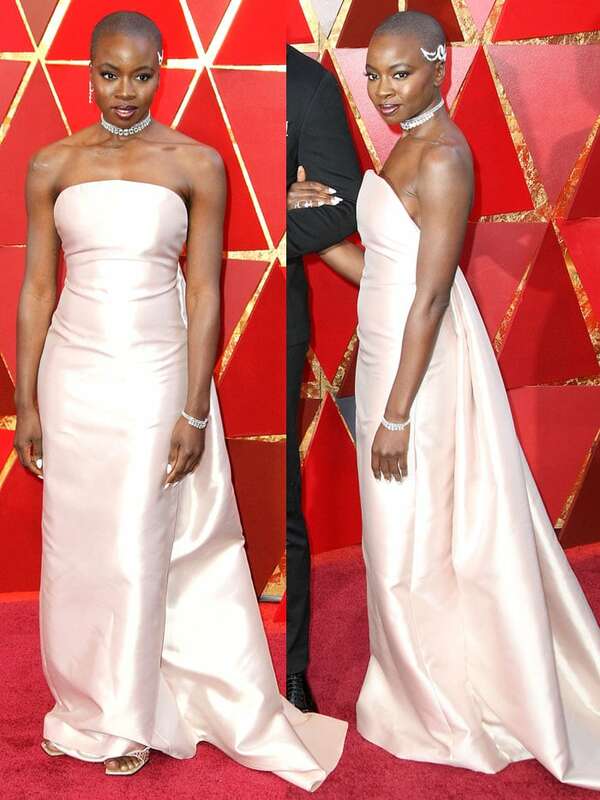 Lupita Nyong’o and Danai Gurira, co-stars of the biggest superhero movie right now, lent their star power to the 2018 Academy Awards held at the Dolby Theatre in Hollywood on Sunday. The “Black Panther” actresses posed together on the red carpet and dazzled the cameras in shiny dresses, ankle-strap sandals and touches of interesting accessory details in their hair. 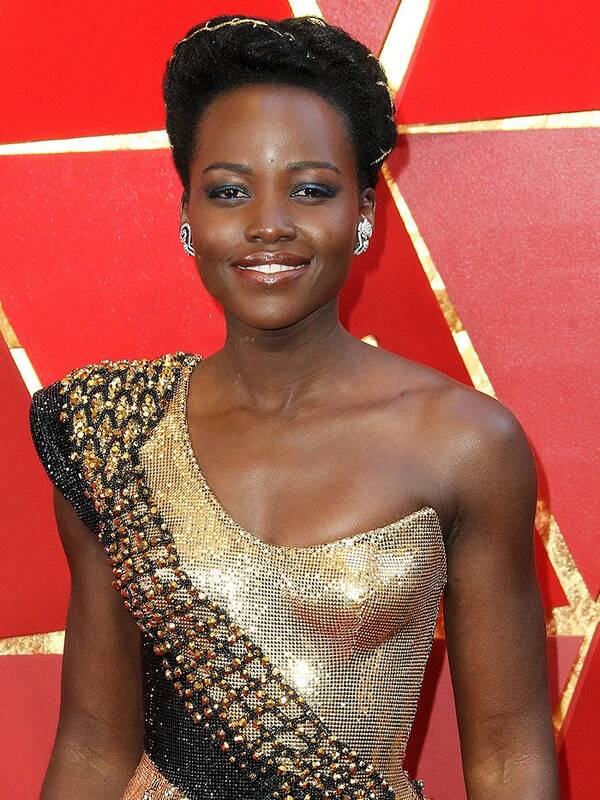 Lupita was an Oscar statuette come to life in an Atelier Versace metallic gold one-shoulder dress with a netted black-and-gold sash design going down the thigh-high split. The 2012 Best Supporting Actress Academy Award winner added glam with Niwaka jewelry and finished with the same custom Alexandre Birman suede ankle-strap sandals she wore to the “Black Panther” European premiere. She rounded out her gilded look with a gold string woven through her short, twisted hairdo. Lupita Nyong’o with a gold string woven through her short, twisted hairdo. Lupita Nyong’o at the 2018 Academy Awards (Oscars) held at the Dolby Theatre in Hollywood, California, on March 4, 2018. 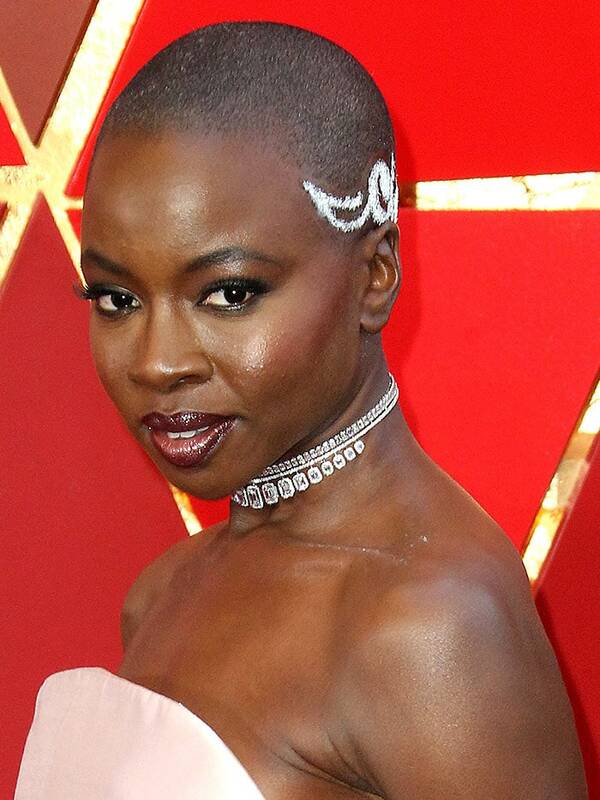 Danai Gurira made her close-shaved buzz cut even cooler by painting a metallic white color into the pattern. She matched the standout head stamp to her pinkish-white Gabriela Hearst Fall 2018 gown that features a curved neckline and a pleated gathered train at the low-cut back. The 40-year-old actress completed her ensemble with a beautiful diamond choker necklace and Sergio Rossi “SR1” crystal-studded sandals that you can buy at Farfetch. Danai Gurira in a Gabriela Hearst Fall 2018 column gown and Sergio Rossi “SR1” sandals. Danai Gurira at the 2018 Academy Awards (Oscars) held at the Dolby Theatre in Hollywood, California, on March 4, 2018. Details of the Sergio Rossi “SR1” crystal-studded sandals on Danai Gurira. Danai previously wore the black leather version of the same Sergio Rossi “SR1” sandals to the 2018 Hollywood Beauty Awards. 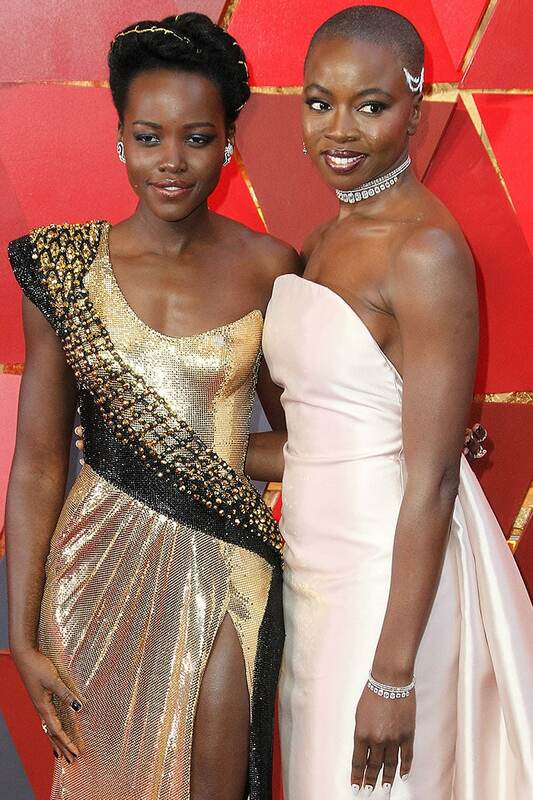 “Black Panther” co-stars Lupita Nyong’o and Danai Gurira pose together on the red carpet at the 2018 Academy Awards.